Air Force Master Sgt. 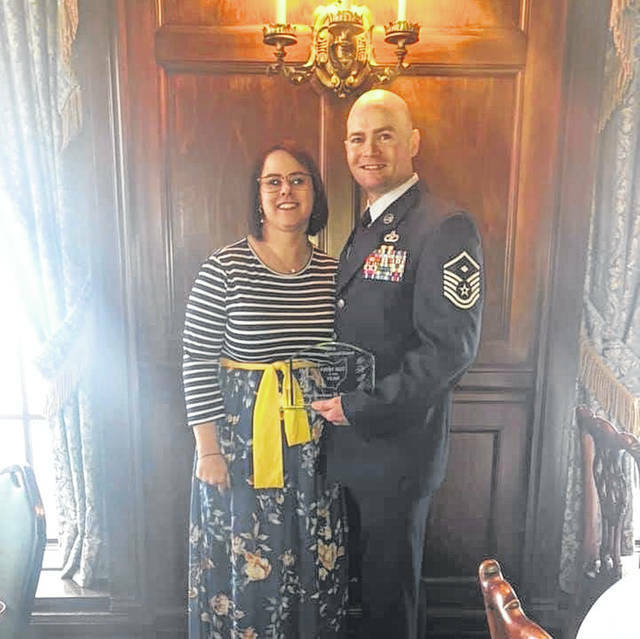 Joshua Brashears and his wife, Brittany Brashears, are photographed just after he received the state’s First Sergeant of the Year award in a ceremony at the Toledo Club on Jan. 12. U.S. Air Force Master Sgt. Joshua Brashears, director of facilities at Urbana University, received the state’s 2018 First Sergeant of the Year award in a ceremony at the Toledo Club on Jan. 12. Although living in Mechanicsburg, he is the first sergeant for the 200th RED HORSE Detachment 1 in Mansfield, where he oversees mission effectiveness of the enlisted members under the authority of the commander. Brashears enlisted in May 2001 to the active duty Air Force, but transferred to the Ohio Air National Guard in July 2004. He has deployed 27 times over the course of his 18 year career, including as part of Operation Iraqi Freedom and Operation Enduring Freedom, which took him to Iraq and Afghanistan. He said he joined the active duty Air Force because his father had served for 24 years before retiring, and that it had become a family tradition. 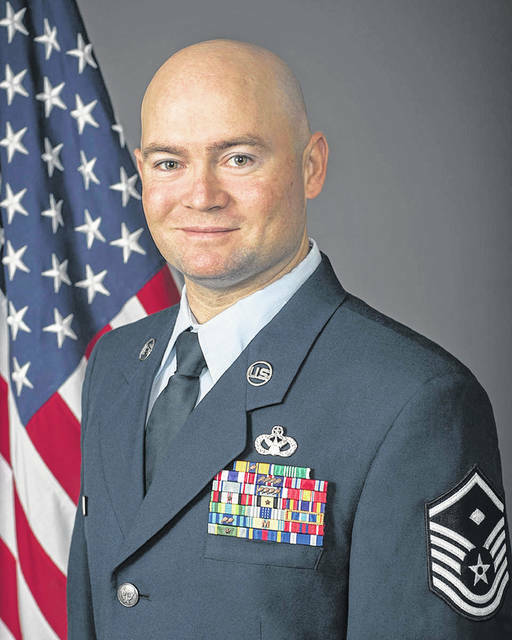 He attributes his success as a First Sergeant, whose role is to communicate the orders of the commander and ensure those orders are followed, to his willingness to engage with lower enlisted airmen. RED HORSE is an acronym that stands for Rapid Expeditionary Deployable Heavy Operational Repair Squadron Engineers. They last deployed as a unit in 2010, but Brashears said his unit has such a high tempo that they travel around the world frequently. National Guard soldiers typically train once a months and for two weeks a year, but RED HORSE typically serves in uniform much more often than that. Brashears was selected to appear before a board of officers at the RED HORSE detachment, who reviewed his whole military career and community involvement, then forwarded his packet to the state level. He said he plans to remain in Ohio and retire from RED HORSE.